Potty training can be a bit tricky, but adding a fun incentive to the process just might encourage your child to train a little quicker. 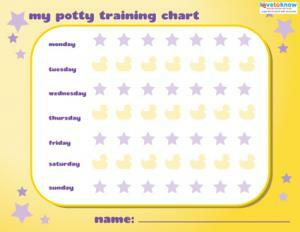 Potty training charts can help little ones stay on track as they earn rewards for their successes. 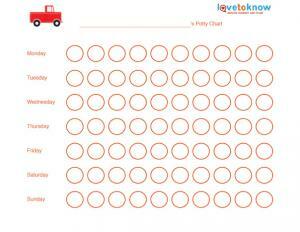 All of these potty training charts can be printed out for use at home. Just click on whichever one you want, and then click on the printer icon after the file opens. Note that you will need Adobe to open them. If you do not have it, you can download it for free. Is Your Child Ready to Start Potty Training? If you need help downloading these charts, check out these helpful tips. Click to download and print this chart. Click to download print this chart. 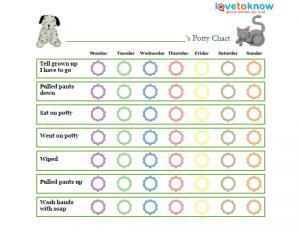 Potty training charts are used to track a child's progress. When she uses the potty instead of training pants, the chart is marked in some way. You could just add a check mark when your child does well, but the chart is more effective if you use it as an incentive to encourage your child. You could also use the chart to keep track for bigger rewards. For example, if your child uses the potty for an entire day without having any accidents, he could earn a reward like watching an age-appropriate video or having a small bowl of ice cream or a piece of fruit. Potty charts can be great motivational tools if you use them consistently. Print one of these charts, tape it to the wall near your child's potty chair, and start marking down all those successes. Your child will begin to develop a sense of accomplishment and pride as he becomes one of the "big kids."